On this page you'll find our recommendations for farm to Ember Quests. We've compiled tips on complete guide to Ember farming. Please refer to this guide if you want to farm Ember Quests in FGO. The aim for Ember farming from the beginning should be "Expert"
For the "Ember Gathering" Quest, you should straight away be aiming for the most difficult level: Expert. Although tough, there is a huge difference in the rate you earn EXP points between Advanced and Expert. You can consistently clear Expert Quests, depending on the Support Servant you bring with you. It's possible even if your Support is not a Friend, so as soon as you have fulfilled the conditions and unlocked the Expert levels, give them a try. Since returns are low for the amount of AP used even for difficulty levels other than Expert, it's best not to bother with the "Ember Gathering" Quest until your max AP is over 40. Stick with the Story Quests until your Master level reaches 17. The "3★ Ember" - which you can get up to one of per run at Expert level - is normally . Once you've collected enough of these, you can exchange them for "Summon Tickets" or "Fou Cards". 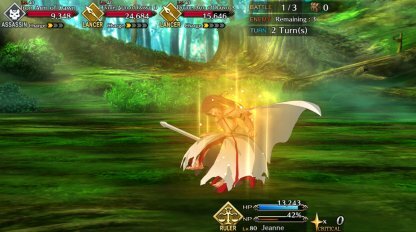 With this farming method, use a "Ruler" Servant as your Support. "Rulers" take half damage from almost all other Servants. Have them crush all your enemies by themselves.The Quest can be safely cleared even when all your own Servants are at Lv.1. 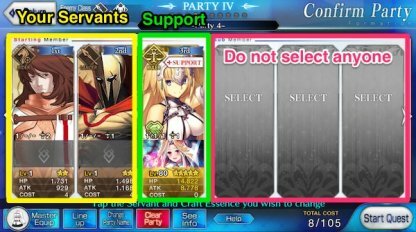 First of all attempt the Quest with a party Setup of only three Servants - two of your own and one Support. For the Support, look for a If you can't find one, tap the "Update List" button. ▲Essentially it's actually better if your own two Servants are at Lv.1. The earlier they are knocked out of battle, the easier it is for the Support Servant to clean up. ▲In the Support Select screen, pick the far right Class, then look for a Servant with a mark like a set of scales. ▲Your Master will be equipped with the default Mystic Code, and should have already started leveling up through the Story Quests. Simply choose the Command Cards of the Support Servant you’ve brought with you. So you can increase the number of their attacks, it's better if the two other Servants are at Lv.1 and are defeated easily. ▲"Georgios" or "Leonidas I" are ideal. They have a Skill that focuses enemy attacks on themselves, and can make an early exit from the battlefield. "Berserkers" are effective against "Rulers" so try to knock out these enemies first. Then go for "Archers" and "Assassins" who can more rapidly deploy Noble Phantasms. Tap on the enemy you want to wipe out first. To avoid any slip-ups, use your Master Skills at set times. When HP starts to get low for your Support Servant use "First Aid", and when trying to knock out the toughest enemy in the third wave, use "Instant Enhancement" to raise your ATK. 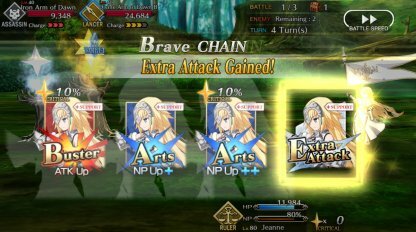 With this farming method, use a "Berserker" Class Servant as your Support. This Class deals 1.5 times more damage to all enemies. Then crush the opposition together with your own Servants. There is a chance you can slip-up with this method, but it does mean speedier farming than STEP 1. First of all Setup a Party with Enhanced Servants you hold that are either an advantageous Class or Berserkers. For the Support, choose a powerful Berserker. 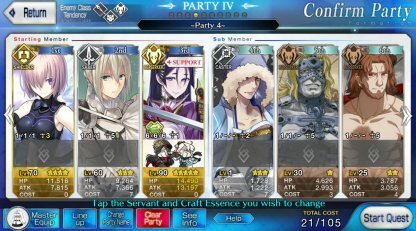 If you have a Servant that can defend your Support, they can also be useful. ▲In STEP 1 the Sub Member slots were left empty, but this time, if you can, select Servants for these slots too. When attacking, aim for the formula: "1 turn = 1 enemy + x". Select a Buster Card first to raise the damage, and always try to attack with a Servant of an advantageous Class. Even though the intention is to defeat your enemies quickly, as your Support is a Berserker they will take a great deal of damage. For steady farming, protect your Support with DEF buffs and by drawing away attacks. Berserkers like "Minamoto no Raiko" with Area of Effect Noble Phantasms are great to have. When they are equipped with the Craft Essence "Kaleidoscope", and by one of your Friends, you can unleash this power straight away. 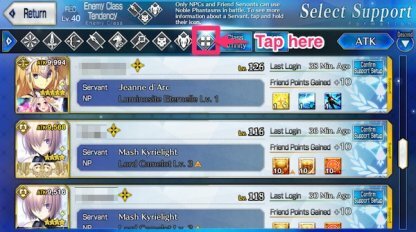 If you spot these pairings, don't be shy in making Friend requests. With this farming method equip your own Enhanced Servants with a Craft Essence that gives a starting NP charge of 50-60%, and use their Area of Effect Noble Phantasms to wipe out the opposition. Aim to rapidly release Phantasms with Support Servants that also charge NP. First of all equip Craft Essences with a starting NP charge of 50% or more to Enhanced Servants that are either of an advantageous Class or Berserkers, and have an Area of Effect Noble Phantasm. 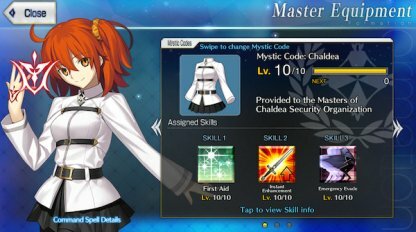 For your Mystic Code, use the Chaldea Combat Uniform so you have the Order Change Skill. ▲The Confirm Party screen before going into battle. Our recommended Support Servant is Zhuge Liang, who can grant a 20% NP charge to the whole party, and 30% charge to an individual. Aim to fire off your Noble Phantasms as soon as the battle starts, using the Support's NP charge Skill. When there are Servants without a full gauge, use one Noble Phantasm as the third Command Card and earn some more NP by using Arts Cards first and second for those Servants that need it. After using a Noble Phantasm and a Servant's NP gauge is at zero, use the Order Change Skill to switch to a Servant with a charge built up. Fully charge this new Servant with a regular Arts Card attack, an Arts Chain, or by using a Skill. ▲Order Change is a Master Skill that comes with the Chaldea Combat Uniform. With this Skill it’s possible to switch a Party Starting Member with a Sub Member during battle. 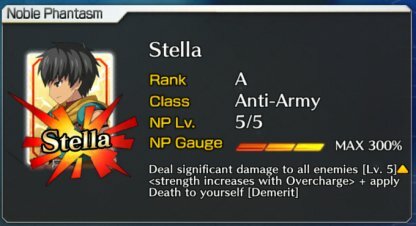 Arash’s Noble Phantasm has the effect “Apply Death to yourself”. After dealing damage to all enemies, Arash is killed instantly, so a Sub Member automatically takes up his spot. In this case there’s no need to use Order Change. 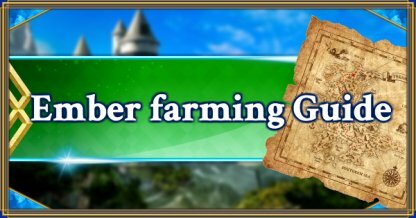 ▲Although this is described as a Demerit in the game, it’s actually a big advantage when farming Quests. With this farming method equip your own Enhanced Servants with a Craft Essence that gives a starting NP charge of 75-80%, then each turn release a Noble Phantasm to wipe out the opposition in 3 turns. Rapid farming becomes possible, increasing at once the amount of Embers you can collect per hour. First of all equip Craft Essences with a starting NP charge of 50% or more to Enhanced Servants that are either of an advantageous Class or Berserkers, and have an Area of Effect Noble Phantasm. If you are using Arash, the Chaldea Combat Uniform won’t be necessary. Aim to fire off your Noble Phantasms as soon as the battle starts, using the Support's NP charge Skill or your Servants’ own Skills. Then after the Noble Phantasm has finished, immediately switch using Order Change. 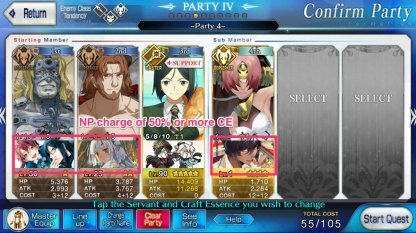 ▲Spartacus or Arash can charge their own NP gauge a maximum of 30%. Equipped with a Craft Essence with a starting charge of 75-80%, they are able to launch a Noble Phantasm straight away without any help.